This week has been a hard one for the livestock industry. Earlier in the week HSUS released an animal abuse video reportedly taken on a swine farm out West. The video is very graphic and disturbing. After much thought and reading other blogs I decided I would cover this as well. First let me say we do NOT condone this type of behavior from anyone in the livestock industry and firmly believe that they should be prosecuted to the full extent of the law. You can view the video here if you would like. Like all industries we have bad apples and agriculture works diligently to get rid of them. I am appalled by the behavior in this video and the person who videoed it! How do you allow that to happen and not speak up? If you are honestly trying to protect the animals you speak up... you don't let it continue and you definitely don't sit on the video for months prior to releasing it. So how do we ensure that we are caring for our livestock on our family farm? The first thing is we have a discussion with all new employees on how we expect our livestock to be treated and the consequences for not treating livestock properly. We also have implemented low stress handling techniques that are required to be used. My husband and I have been working to create an on farm livestock handling guide that would be given to all employees including family members. We provide food, clean water, and shelter for all of our livestock. At least one person visually checks on all the dairy heifers, dry cows sheep and horses daily. Beef cattle are checked in a rotation (2-3 times/week) as we are a family farm and don't have the man power to check every single cow each day (cows are scattered in pastures from one side of the county to another). The milk cows are given a once over twice a day by at least 2 people many times its 3 or 4. And last but not least are our dairy calves...they are checked on when we feed them twice a day. In addition to all of our daily inspections our vet also comes out once each month to go through the dairy herd with us. This helps get an extra set of eyes on the cows, heifers, and calves. We go to great lengths to ensure the health and productivity of all of our livestock. Getting ready to go check fences. Ensuring that all of our fences are in good condition allows us to keep our animals safe from predators and cars. Walking out to check water troughs. This group of cattle congregating at the trough makes us suspect something isn't working correctly. In this case it apparently it was just time to chat at the water cooler. If you look really close you will notice 2 cows and newborn calves. Now you might be concerned I wasn't closer to really inspect them. Some cows don't like for you to invade their space for many days after calving, had I tried to get any closer they would have spooked and could have injured themselves or the calves. Some cows are much more social able. This particular cow allows my son to put a halter on her in the pasture and drag her around like a stuffed animal (Please note my son is 4 and weighs 35 lbs...she on the other hand is close to a 1000, so he's not hurting her). 1) Wyatt's not quite ready to ride a horse by himself in a pasture with cows and calves because if his horse spooked he couldn't control him and PawPaw typically checks cows with us and he can't climb in the saddle anymore. Side note: I was checking cows on horseback at 8, cows darted out from behind a tree line, spooked horse and he left me with a goose egg above my eye for 2 weeks. 2) The buggy is super quiet and doesn't disrupt them while grazing. Cow waiting in the holding pen at the milk barn. She is waiting for her turn to enter the line. Not only are milk cows checked out while they are milking but while they are waiting we check them as well. Wyatt goes daily sometimes 3-4 times a day to check, feed, and love on this heifer. It is his personal heifer and penned with Rachel's show heifer. These cows get extra special attention around our house. The longhorns are kinda like guard dogs they protect the dry cows from predators and on occasion tear down fence. Ewes are checked daily to ensure they are maintaining weight and doing well. We also do our best not to interfere with the birthing process if possible. Our goal is for all of our ewes to lamb unassisted in the pasture and raise lambs to a weaning weight of 60 lbs. We use sorting paddles. These paddles make noise which helps move the animal without us having to get into the animals personal space. All animals have a flight zone and if you invade the flight zone the animal will do whatever it takes to get away even if that means injuring itself. To prevent that we use paddle such as these to move and sort cattle. This is the safest way for animals and people. My 4 year old is great at helping get up the 2nd group of milk cows using a paddle. So now that you have seen how we ensure proper care for our animals its your turn to ask me questions. Ask me any questions you have about livestock management a chance to win a $25 grocery store gift card! I'll be sharing this on facebook!!! Congratulations Katie!! You are the winner of the $25 gift card. 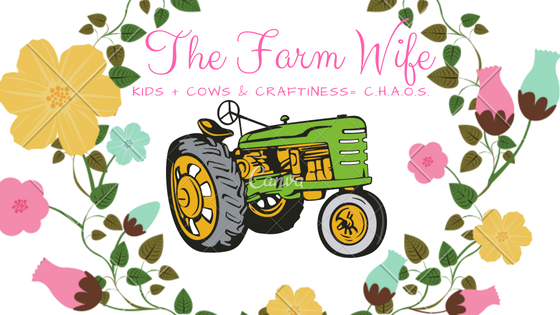 Please email your contact information and the name of your favorite grocery store to scfarmwife@gmail.com! Have a blessed weekend! Thanks Catrina! Be sure to follow the blog or my Facebook page...more chances to win coming soon!